Knowing these tips could save you from getting in an accident. Once considered the knights of the highway, truck drivers—and the massive rigs they operate—are now viewed by many as threatening and even dangerous. The trucks are huge and heavy, and can seem haphazard as they barrel down the road. However, since consumers largely depend upon 18-wheelers to transport everything from groceries to gasoline to household goods, learning to share the road safely is in everyone’s best interest. 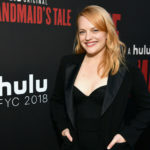 There is good news. The Bureau of Transportation Statistics reports that the total number of freight transportation-related fatalities declined by 23.8 percent from 2000 to 2015. In addition, the U.S. Department of Transportation’s Federal Motor Carrier Safety Administration is making significant efforts to increase commercial motor vehicle safety. But in the meantime, you may have more control over your own safety than you realize. Numerous studies indicate that passenger vehicles are largely at fault in fatal crashes with commercial trucks. 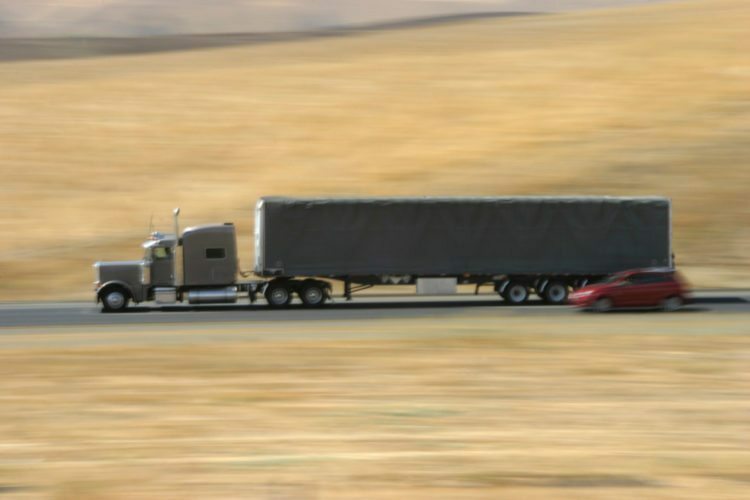 Because of their size, however, truck crashes are more likely to result in fatalities. According to Insurance Institute for Highway Safety, Highway Loss Data Institute, a total of 3,986 people died in large truck crashes in 2016. Of those deaths, 66 percent were occupants of passenger vehicles. 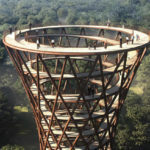 By comparison, the National Safety Council reports that as many as 40,000 people died in motor vehicle accidents. Experts such as those at the Ohio Department of Transportation state that learning how to drive safely near tractor trailers can save lives. Learning what truck drivers can and cannot control can help you stay safe and enjoy the ride when you are on the road. So what can you do? One reason driving alongside a truck is dangerous is because the driver may not be able to see you there. Commercial drivers have blind spots on both sides of the vehicle, as well as at the front and back. 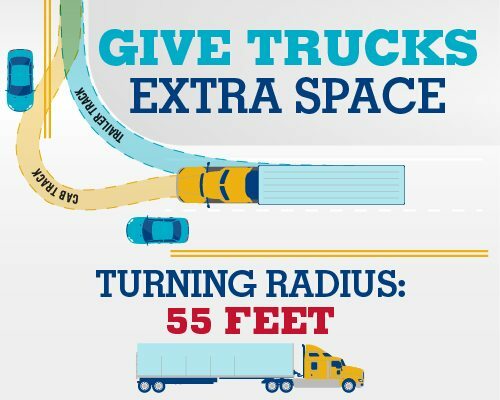 It’s especially important to stay out of these “no zones” when a truck is turning, backing up or changing lanes. Many commercial vehicles have speed governors that prevent them from driving past a certain speed. If you need to get past a truck, make sure you are far enough back to see the driver in the mirror. Signal and pass on the left, taking care not to linger in the driver’s blind spot. There are other reasons to avoid driving alongside or closely behind trucks. For instance, if the truck blows a tire, you could suffer serious injury, plus damage to your vehicle, if you’re too close. 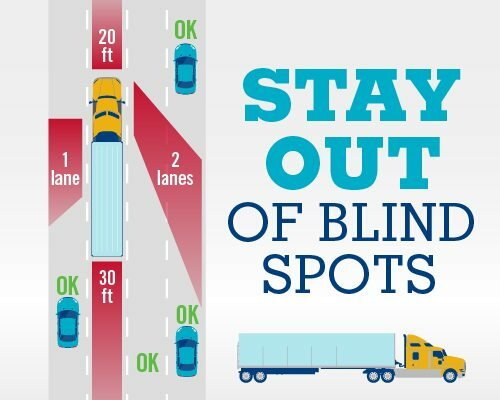 Trucks make wide right turns, so if you’re in the blind spot when a driver needs to make a turn, you could be in trouble. In addition, if you’re driving too closely behind a truck and fail to stop in time or are hit from behind, your vehicle could slide under the truck. Compared to a 3,000- to 4,000-pound car, a tractor trailer can legally weigh as much as 80,000 pounds. A fully loaded truck traveling 65 miles per hour will take almost the length of two football fields to stop in ideal conditions. 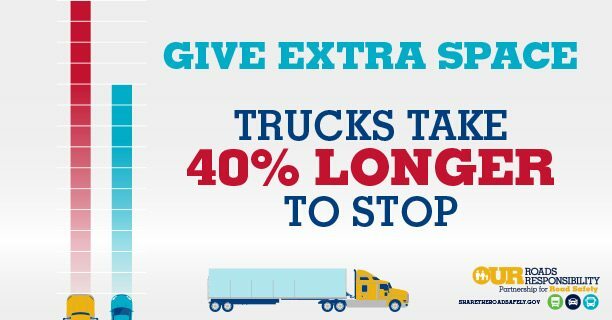 Avoid cutting off trucks and leave enough distance between you and any truck behind you for safe sudden stops. And finally, any time you’re on the road, whether you’re driving near a big truck or not, keeping your full attention on the road and on your surroundings is essential. Distracted driving is dangerous. When you are alert and aware, you can be sure that you’re doing your part to stay safe on the road.